The Delta Omega chapter of Alpha Phi Omega has the distinction of being the longest running national fraternity on the University of Houston campus. Our history began in 1946 with the founding of a local fraternity by the name of the Eagles. The founding group then petitioned the national office of Alpha Phi Omega for chapter status, and Delta Omega was born as the 120th chapter of APO. The formal chartering ceremonies were held on April 13, 1947, in the cafeteria of the Earl North Brick Company, with the Alpha Rho chapter at the University of Texas at Austin conducting the installation. The first Delta Omega president was John Pound. Immediately upon our founding, the Delta Omega Chapter began playing an important role in campus activities. Some of the responsibilities we shouldered included sponsoring and information booth in the Recreation Building, ushering at all football games, publishing the Cougar Student Directory, officiating at election polls, arranging freshmen orientation, and sponsoring the "Ugly Man" contest, which raised funds for different campus causes. Coming early in our history was the building of the annual homecoming bonfire, which was built by APO for 49 years until 1998 when the Student Program Board took up the responsibility. For several years APO also sponsored the homecoming dance. This has since become the responsibility of the Student's Association. One of our major activities during these early years was the participation in Frontier Fiesta. APO organized the "Dry Gulch Opry House," a silent movie theater, and then ushered in the tradition of sponsoring "Bayou Queen," a variety show characteristic of the showboat era. Alpha Phi Omega placed among the top shows for several years. About that time APO became the official guardian of the University of Houston mascot, Shasta I. It was Alpha Phi Omega that raised funds to purchase Shasta and her cage for the university in the 1960s. The Cougar Guard, consisting of brother s APO, accompanied Shasta to all the football games, even those out of town. It was a responsibility we carried until the early 1970s. In 1955 APO began sponsorship of the annual Greek Song Festival, which was for years one of the highlights of Greek Week. In 1965 another important school-wide project cam into being. The first annual Valentine's Day Dance was held in February of that year in the Rice Hotel. With this dance APO took over the responsibility of presenting Miss Houston and the Vanity Fair Beauties, which had formerly been presented at Koobary Hall, sponsored by the yearbook. At this dance the first Valentine's Sweetheart was presented. Bill Miller and Jerrold Pesz of Delta Omega were the chairmen for the dance, which was an annual event through 1969. During the last second half of the 1960s APO was active in campus politics, with many members serving on the student senate. Richard Poston, the president of Delta Omega in the fall of 1967 and the spring of 1968, served as the president of the Student's Association for the 1968-1969 school year. It was to our lasting pride that during our first year of existence we were chosen to receive the School Spirit Award as the organization that had done the most for the campus of the University of Houston. The award was won consecutively until 1959, and has been won frequently since then. Following the last Frontier Fiesta before it was restarted in 1993 the chapter suffered a brief period of decline. This was to be short-lived, however, as the chapter picked up many new projects to replace Frontier Fiesta. Although Delta Omega averaged over 5,000 man hours of service to the campus it did not ignore its duty to serve the community and the nation. During these early years the chapter adopted many projects that became annual traditions, including the Thanksgiving Dinner project for St. Anthony's Home for the Aged, making Christmas baskets for families in need, and participating in the March of Dimes. One of the most famous national service projects Delta Omega was involved in was the annual Heart Fund Bathtub Pull, organized to raise money for the American Heart Association. The first annual Bathtub Pull was arranged by Randall Schott and Kent Whitaker, but it was primarily the brainchild of Don Macleod, who organized the project on two weeks' notice in February of 1969. To raise money and gain publicity a bathtub was pulled from Houston to Austin via major college towns in East and Central Texas. This project was later adopted by other chapters in Texas, and it became the official sectional project, raising more than fifty thousand dollars for the American Heart Association during its existence. Located on the University of Houston campus is a very special monument. Unfortunately, not many people know why it is there or who donated it. 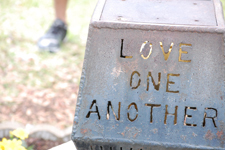 The Eternal Flame of Service monument was erected to recognize every organization, fraternity, sorority, and individual on and around the UH campus who works to serve others. It is a gift from Delta Omega to the university. In December of 1970 the 21st National Convention of Alpha Phi Omega was held in Dallas, Texas. The two voting delegates representing Delta Omega were Craig Litton and Frank McClenny. After the closing banquet of the convention these two met with the eminent Dr. H. Roe Bartle. During the early hours of December 30, in the privacy of his room, Dr. Bartle lit a small blue candle the he in turn used to light a hurricane lamp. Dr. Bartle then requested that two other Delta Omega members be allowed to enter the circle of men formed by the newly-elected National Board of Directors and President Aubrey B. Hamilton. The flame was then passed from the blue candle to each of the board members' candles. Dr. Bartle then joined the board members to light two four-foot candles. The flame was then taken to Houston and allowed to burn while awaiting the completion of the Eternal Flame site. "The Eternal Flame of Service is dedicated to all Organizations and Individuals in and around the campus of the University of Houston who have shouldered the responsibility of daily helping their fellow man. Built by Alpha Phi Omega with funds for campus improvement donated by the students and campus community. Ignited by H. Roe Bartle on December 30, 1970." (3) two small aluminum pocket crosses, one each with the following inscriptions: "Jesus is Lord" and "God Loves You"
The first optimal opening date for the time capsule is on October 25, 2071. The Eternal Flame of Service was built to act as a daily reminder of service. As Benjamin Franklin once said, "The most acceptable service to God is doing service for man." Delta Omega brothers shoulder the responsibility and honor of delivering the Eternal flame and presenting it at each Alpha Phi Omega National Convention. In fact, it is the lighting of the flame during the opening ceremonies by Delta Omega that officially begins the convention. During the late 1970s Alpha Phi Omega and Delta Omega underwent many changes. Pressured by the "Title IX" of the Texas Education Act, and many chapters that wanted APO to open up its membership policies, the 1976 National Convention voted to allow women to become members. While many chapters flourished from this new policy, Delta Omega did not. Allowing women to pledge, along with other trends away from the traditional Greek values led to a decline in chapter membership until 1981. Since then several new projects came into existence, including St. Dominique's, MacGregor Park Clean-up, and the Ben Taub project. In 1989 Delta Omega helped charter the Alpha Gamma Zeta chapter at Houston Baptist University. In 1986 Delta Omega hosted the 29th National Convention in Houston. In the late 1980s it was discovered that the Eternal Flame of Service was no longer burning due to an underground gas leak. In 1993 plans were proposed to move the site of the monument to the center of the Cullen Fountain. This idea was rejected, however, because it would require the premature disturbance of the time capsule. Delta Omega changed and grew considerably throughout the 1990s. Unfortunately, as of 1998, no longer does Alpha Phi Omega hold the distinction of being solely responsible for the University of Houston Homecoming Bonfire, although members work diligently to reclaim this honor. Members of Delta Omega do, however, continue to serve on important positions on the Homecoming committee. Delta Omega also continues to enthusiastically participate in Frontier Fiesta and is awarded almost every year. Another service that Delta Omega continued to provide for the University of Houston during the 1990s was the selling of programs at basketball and football games. Delta Omega also participates heavily in projects throughout the community. Some of our favorite projects have been the Children's Museum Arts and Crafts Project, the Explorer Happening Project, and Special Olympics projects. The sheer size of the chapter grew in the 1990s and early 2000s, with an average of 20 pledges initiated each semester. April 13, 1997 was a proud day for the members of Delta Omega. On this day members from past decades were on hand to celebrate the chapter's 50th anniversary. Among the festivities that members from five decades took part in included the rededication of the Eternal Flame, a fellowship picnic, and a banquet.